Poet Kwame Alexander has won acclaim for many things – creating the Capital BookFest, a touring book festival which reached more than 10,000 people, pioneering his Book-in-a-Day writing and publishing program which has turned more than 1000 teens into student authors. But today, he’s winning kudos for something entirely new: writing for children. 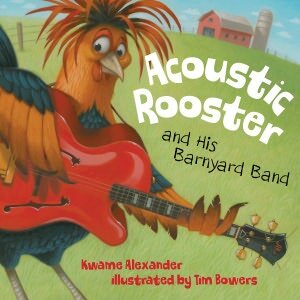 During a summer in Tuscany, Alexander wrote Acoustic Rooster and His Barnyard Band (illustrated by Tim Bowers, published by Sleeping Bear Press), a jazzy story of a rooster who dreams of winning a barnyard talent show. Filled with fun characters like Mules Davis and Ella Finchgerald and vibrant art, it’s already a winner. The book has been nominated for a NAACP Image Award and been selected as a featured title for the 2013-2014 Choose to Read Ohio program, a statewide reading initiative sponsored by the State Library of Ohio. Brooklyn Public Library. New York. 1978. I remember being forced to walk across Linden Boulevard. See we read at home all the time. My father was a writer, my mother and English teacher. Our walls were lined with shelves and shelves of books, so the idea of spending a fun day on a Saturday at the library was torturous at best. Once we got there, it was not too bad. My sisters were making beads and crafts in one room. My mother was reading a vegetarian cookbook somewhere, I was watching a film. It was truly a family experience. And it was joyous for each of us for our own reasons. Even my father, who was always busy being a revolutionary, attended, and was usually doing research. He’d written 16 books, and we had to read each of them. He was never too talkative (with us). Any answers we needed were to be found in books (and there were always quizzes). Aside from the books that lined the walls of our home, there were close to a hundred milk crates stocked with books. They were his most prized possession. He was in such a love affair with books that he decided when I was three, to start a publishing company. And we, my sisters and I, were his employees. We licked stamps for envelopes with catalogues in them, we worked trade shows. We even used to answer his business line. Back then, phone service was so expensive, so we only had one line—for personal and business. I literally hated all things literary, by the time I was a teenager. When I went to college to study biochemistry, I wanted to be as far away from hardcovers and paperbacks as possible. Of course, two things happened during sophomore year that would bring my life full circle: 1) I encountered a course called organic chemistry, and 2) Nikki Giovanni became a visiting professor at my college. I changed my major to English, and four years after graduation, my first book came out. I now have fourteen books published—poetry, non-fiction, fiction, how-to, and children’s—and both of my daughters have or will be reading all of them. Being the father of a three-year old, I read about five different children’s books a night. If it were not for the library, I’d go broke. I am inspired by countless poets who write children’s literature. I tell my poet friends all the time, that all the ingredients that go into making a good poem—concise language, imagery, rhythm, etc.—are perfect for cooking up a good children’s book. Plus, you can make a little bit of money. For that reason, I have been influenced by the greats: Nikki Giovanni, Naomi Shihab Nye, Walter Dean Myers, Lucille Clifton, Leslea Newman, & Eloise Greenfield. Because I think of myself as somewhat funny, there are some contemporary writers that I love reading as well. Books like Giraffes Can’t Dance, Click Clack Moo, and everything by Mo Willems. I speak at a lot of writing and literacy conferences. I especially love the conferences for librarian and English teachers. Anyway, I was delivering a workshop at the Florida Reading Association conference in Orlando. I think the topic was using poetry to engage student readers. What I remember most about the workshop, is that there were about five people in the room, including me. But, I read a lot of poetry, and we had lots of fun. I guess there was a little buzz around my workshop, so much that the conference director asked me to stick around the next day and be a featured author at the luncheon. She guaranteed that there’d be a lot more than five people. The next day, I, along with three children’s authors, read at the author’s luncheon. Unlike the other authors, I hadn’t written a children’s book. And so, I read and performed pieces from some of my poetry books. The audience response was bananas! You would have thought it was a rock concert, and I was the star. Afterwards, I sold and signed quite a few poetry books. One of the children’s authors, Brad Herzog, asked me if I’d ever considered writing children’s books. I told him “yes,” that I had (even though I’d never seriously entertained it). Weeks later, we emailed each other, and I asked him for a contact at his publisher, Sleeping Bear Press. Subsequently, I sent his editor a few of my poetry books, which she said she really enjoyed. We then exchanged emails, and in one of the emails I mentioned that I was working on a few books for kids (which I wasn’t). She asked to see them, and so I set off to write my first children’s books. The first was a picture book based on an old South African folktale that Eartha Kitt made famous, and my mom used to tell me as a kid. The editor didn’t much care for it. The second was a picture book about a Rooster who plays Jazz music. The idea came to me one morning when a group of birds were “singing” outside my window. On a trip to Tuscany, I was able to fine tune the idea after an encounter with about twenty roosters on a gravel road. Acoustic Rooster & his Barnyard Band was born. The editor loved the book. The whole process, from meeting Brad at the conference, to signing the book deal, took about six months. I know that people generally are predicting the end of printed kids picture books. I don’t buy it. My three year old gets to play with our iPad for maybe 30 minutes a day. She loves it, and that can be expected. But, here’s the rub. Every night, after she brushes her teeth, I tell her, “Okay, Samayah, go and get a book or two for me to read.” Not once, has she gone to get the iPad. As much as she loves it, as many eBooks that are on there and that she likes reading, when it comes down to our nightly ritual of father-daughter bonding, she runs and gets a book. A real book with a spine and pages she can grab and hold (and tear). There is no substitute for the cool, calm kiss of paper on finger. Not saying there won’t be, but right now printed books are beautifully human. And I for one plan on writing and promoting a ton of them. 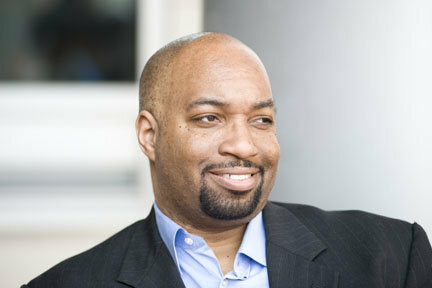 Find out more about Kwame Alexander at www.bookinaday.org.